Food stands along the concourse at the 2013 Iowa State Fair. The Iowa State Fair Board reversed course today on its decision to implement a cashless payment system for the 2014 Fair. Many Iowans, including Governor Branstad, criticized the board’s move this week that would have required fairgoers to exchange cash for tickets – which would then by used to purchase food and drink and pay for some rides. DES MOINES, IA — Iowa State Fairgoers may continue to use their favorite form of payment for their purchases at this year’s Fair. The Iowa State Fair Board has decided today that they will not implement a mandatory cashless payment system at the 2014 Fair. Instead, they will continue to investigate future implementation of a more progressive system that will eliminate Fairgoers’ concerns of the inconvenience of paper tickets and long lines, improve the concessionaires’ reporting system and accommodate the Fair’s infrastructure. The Fair Board strives to make sound business decisions in the best interest of the Fair and its Fairgoers. The Iowa State Fair’s operating budget is self-funding, and all Fair profits are reinvested in Fairgrounds infrastructure and fund a better Fair experience. 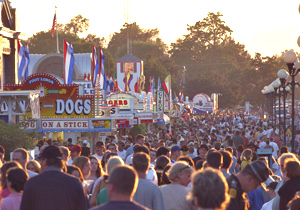 Passionate Fairgoers help make the Iowa State Fair the best in the nation, and the Fair Board strives to implement policies that improve the Fair’s financial integrity while simultaneously benefiting its loyal fans.